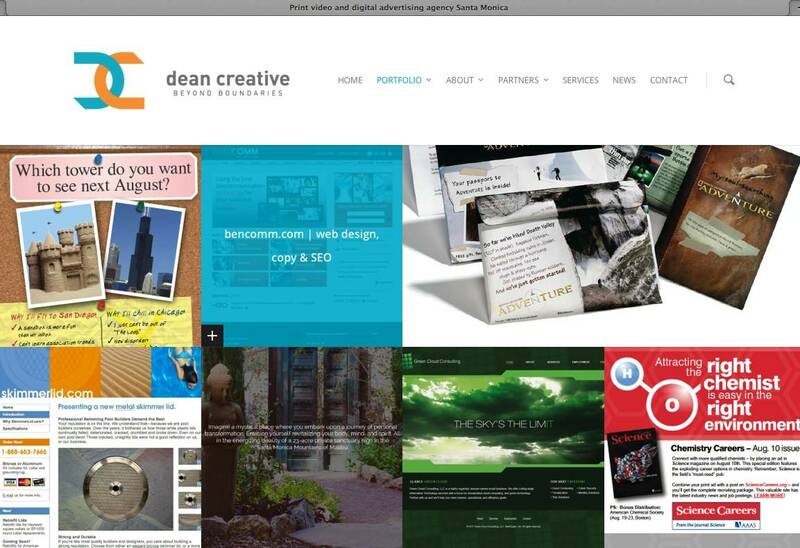 March 1, 2015 — Dean Creative launched a new website today featuring new strategic partners, expanded creative services, and a full branding, advertising, and design portfolio. The new deancreative.com features greater speed, an elegant and responsive design, and a full portfolio of print, digital, and video. The creative portfolio is presented in a fresh and user-friendly way. Each piece is displayed much larger than you would typically see on most advertising agency or freelancer websites. The new presentation creates a stronger impression, allows visitors to read the copy, and gives potential clients a better way to assess creative marketing solutions. Creative political advertising in DC: which ad would you choose? Two bold options for a Washington, DC printing services firm. October 1, 2014 — Dean Creative partnered with S2 Design Lab in Austin, TX to develop creative political advertising in DC. 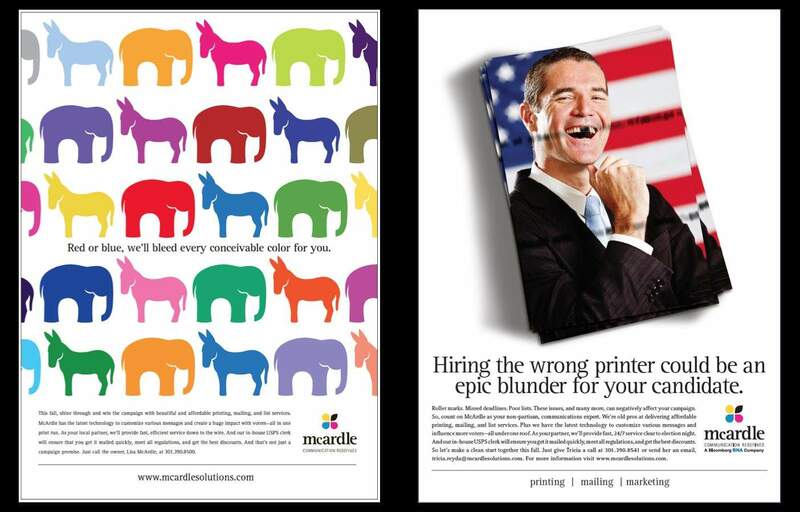 The assignment: a tabloid color print ad for McArdle Solutions, a printing, communications, and marketing services company. The print ad will run during the fall election season in 2014. The ad will be placed in Washington, DC government and political publications such as Hill Rag. Copywriters Peggy and Brian Dean worked closely with Art Director Don Summers to develop five bold, creative solutions. Two of them—the short list of choices for the client—are included here. If you can't write your idea on the back of my business card, you don't have an idea. April 2006 – Alexandria, VA – Dean Creative partnered with Catalpha Advertising & Design to create a print ad and brochure for the Johns Hopkins Hospital (a division of Johns Hopkins Medicine). The focus of the brochure was to inspire area residents to donate blood platelets for surgery related to local cancer and organ transplant patients. Senior Writer / CD Brian Dean supplied visual concepts, headlines and copy. December 2005 – Washington, DC – Dean Creative was hired to write, design and produce the annual report for the Armed Forces Retirement Home (AFRH). The report theme is: “The Strength to Endure.” The book honors the resiliency of the Home’s Gulfport, MS residents the wake of Hurricane Katrina. And it salutes the fortitude of DC residents who endured tornado-like summer storms and welcomed the Gulfport refugees who were transferred here. December 2004 – Washington, DC – Dean Creative crafted a new strategic positioning and brochure for Potowmack Landing restaurant in Alexandria, VA. The new theme: Potowmack Landing. Where your senses soar. This idea leveraged the restaurant’s key waterfront location and expansive view of the Potomac River, the ambience of airplanes landing and taking off from Reagan National Airport, as well as the delectable sight and aroma of fine food served at the restaurant. November 2003 – Washington, DC – Dean Creative generated copy and creative concepts in a variety of projects for the American Psychological Association (APA). Creative elements included several ads, a pocket brochure with a variety of custom inserts, and a comprehensive direct mail campaign. Brian has experience writing for a wide variety of associations and trade organizations including the AMA, ASAE, API, and the AP.